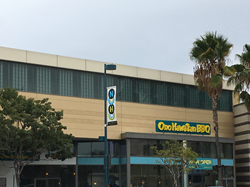 NORTH HOLLYWOOD, CA, DECEMBER 22, 2016 - Ono Hawaiian BBQ is opening its new restaurant today, Thursday, December 22, 2016 in the NoHo Commons Retail Center at 5300 Lankershim Blvd Suite #150, North Hollywood, California. This is the 59th restaurant for the Hawaiian food chain. The Grand Opening Celebration will be announced for a later day. The approximately 1600 square-feet Ono Hawaiian BBQ is the first to feature digital menu boards. The interior incorporates the brand’s industrial chic design inspired by Hawaii’s rustic elements; featuring reclaimed wood walls, rope lighting, aqua tiles, and tropical planters. The restaurant has seating for 45 guests inside the dining room. Ono Hawaiian BBQ is a fast casual restaurant with locations in California and Arizona that serves Hawaiian Plate Lunches and other island specialties. All of Ono Hawaiian BBQ plates are created with fresh ingredients using authentic Hawaiian recipes, prepared daily in each restaurant and grilled fresh to order. Ono Hawaiian BBQ operates 59 restaurants throughout California and Arizona and have plans to open 12 more locations in the next year. Fans can receive promotions and news by “Liking” Ono Hawaiian BBQ on Facebook at http://www.facebook.com/OnoHawaiianBBQ or joining Club Ono. For more information please visit http://www.OnoBBQ.com or @OnoHawaiianBBQ on Instagram.